Solid-state drives are the future of storage; but are they worth it in the present? 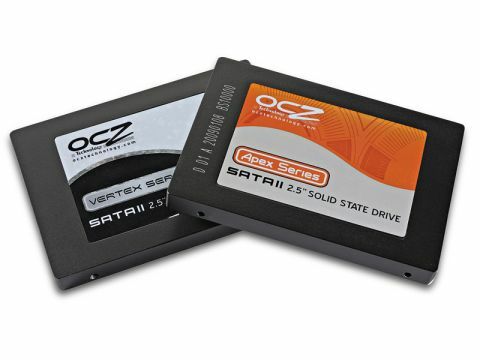 OCZ have released a spate of SSDs onto the market in the past year or so, the most recent being the Apex series and the improved Vertex series. Here we are comparing the drives on performance and whether they are worth spending all that hard earned money on. First off though, we think it's important to compare these mini marvels to the older spinning platter HDDs. We've lived with hard disks as the default storage technology for so long, it's easy to forget that they have some fundamental flaws. Having a platter of metal or glass spinning at high speed while a magnetic read/write head flies tens of nanometers above the surface is inherently fragile; it doesn't take much to crash that head onto the surface of the disk – bye-bye data – no matter how hard manufacturers try to mitigate the dangers with rubber-mounting and Apple's Sudden Motion Sensor. And because of the limitations of how the read/write head actually moves around the surface of the platters, hard disks can be sluggish when reading and writing data, which is fragmented across multiple sectors. They're relatively power-hungry, too, as any moving part can be. Their natural successors are SSDs. Solid State Drives use a storage medium similar to the stuff in memory sticks. Most SSDs use the same enclosure size – notebook-sized '2.5-inch' in the case of the drives here – and SATA interface as standard hard disks, so it's easy to replace an HD with an SSD. The price/capacity ratio is still in hard disks' favour, though; the two SSDs we have here from OCZ – from the mid-range Apex and premium Vertex lines – both store 120GB, while a 500GB hard disk of the same form factor would cost you maybe £100. Surely, then, SSD is just too immature a technology to be worth buying? No. While they're hardly cheap, we will say that they're worth the money. When it comes to reliability, while it's true that SSDs have a finite number of read/write cycles, they're much more robust; stick one in a MacBook or unibody MacBook Pro and you'll be able to throw it about much more. Note that both drives were a smidge larger than our test white MacBook expected; the squeeze gave us problems with the mounting rails. With perfomance, even the cheaper Vertex beats a mid-range 5,400rpm Hitachi Travelstar hard disk in sequential read and write performance, being three times faster. Random write performance is also tripled, and random read performance is 14 times better. The sequential read/write performance of the Vertex is comparable – we didn't see its quoted 240MB/sec speed. But where it shines is in random reads and writes. Its performance made the system feel really nippy. Verdict: Good upgrade for MacBook/MacBook Pro with price/performance balance. Verdict: Excellent performance, but speed topped out at around 130MB/sec.